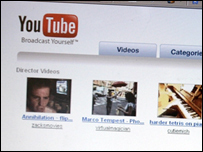 Video site YouTube is launching filtering tools to clamp down on the sharing of video without permission. The tools, called Video Identification, will block copyright material from appearing and spreading on the site. YouTube, which is owned by Google, is currently fighting a billion-dollar legal battle with Viacom over the spread of pirated files. The firm says it currently removes copyright works when it has been told of their existence on the website. The new tools, which are being tested, also give copyright owners the chance to leave their video on the service and to sell advertising around the content. Google and YouTube began working on the copyright protection technology six months ago and have partnered with Walt Disney and Time Warner in testing the tools. "It has taken until now to get it right," said David King, a product manager at YouTube. A statement released by the company said: "Video Identification is brand-new, cutting-edge stuff. Early tests with content companies have shown very promising results." Viacom said it was still too early to tell if the new tools will affect the legal action. "We are delighted that Google appears to be stepping up to its responsibility and ending the practice of infringement," said Mike Fricklas, Viacom's general counsel. The new tools require the cooperation of copyright holders who must provide YouTube with copies of material in order for the firm to compare the files with videos on the site. "We really need the content community to work with us," Mr King said. "We need them to help us help them."